I like to introduce to you the new category of posts in my blog: the Workbench Wednesday. 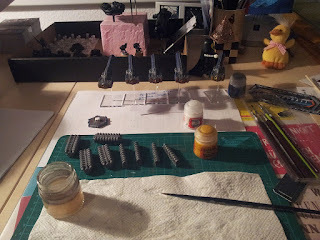 In the process of painting is a squadron of cruisers/heavy cruisers for Firestorm Armada. 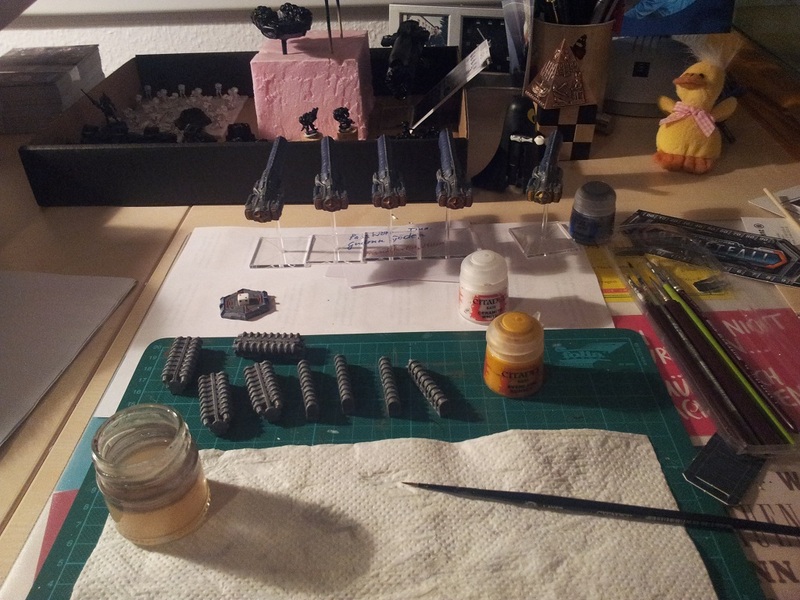 Main colors are applied, currently the glow effects of the drive systems are made. The gun racks for each cruiser variant are magnetized and completed. Also in the main working area is a Sky Drop marker for Firestorm Planetfall, the first thing from the Recon Helix, which i will paint after the cruisers. (should be completed till 13.11., to fullfil the requirements for our gaming club build-up campaign; Link to rules (german) ). In the background you can see (or imagine :) ) the other squads of light walkers, the heavy skiff and some heavy infantry. And last but not least, due to bad lighting not visible, but present in the picture is the sorylian dreadnought.